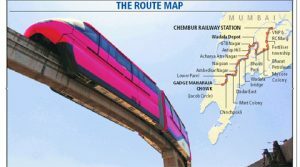 Find Mumbai monorail map, highlights of all the routes, line connect from Wadla Depot to Gtb Nagar, Acharya nagar, dadar east,naigaon, ambedkar nagar, mint colony, lower parel, chinchpokli, jacob circle, wadla bridge, bhakti park, mysore colony, bharat petroleum, fertilizer colony, chembur naka, chembur station. The Mumbai Monorail is 8.93 km stretch comes into operation. It will connect Wadala and Chembur in eastern Mumbai. The hours of operation are 7 a.m. to 3 p.m., with a frequency of 15 minutes. Tickets have been priced at Rs. 5 to Rs. 11, although no monthly passes are available.It is the first monorail to run in India after the closure of the Kundala Valley Railway. Mumbai Monorail is set to become the fifth-largest monorail system in the world.